I finally got Photosynth working on my computer today, and I discovered that I needed a little patience to appreciate this new way of viewing photos. Here are four tips that I have for my past me. 1. When viewing, advance photos by pressing the space bar. This advances through all the photos in the scene, so you won’t miss anything. Note: you will need to click your mouse into the scene before the space bar will work. 2. Also when viewing, it takes a few seconds for each photo to load in and sharpen. If the photos look too blurry, you are probably skipping around too fast. During my evening walk, I headed up the hill behind the post office to catch the end of the sunset. After the last hue of sun faded away, I turned around to head back. 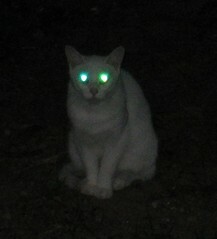 There, to my surprise, was a pure white cat staring at me from the dark of the woods. I stopped to take her picture, but as I approached I sensed that she was guarding something. There was something else in the woods. Since I wasn’t looking for trouble, I only snapped a couple of photos, and took off without getting any closer. The next day, while there was still plenty of light out, I convinced Nikki to come visit the spot with me - I told her that there was this beautiful ghost white cat living in the woods - I left out how scary it was. When we got to the spot, we found a path into the woods directly behind the spot where the cat was sitting the night before. Nikki and I slowly entered the woods and found several small plywood shelters that were only half a meter high, a few cat bowls, but no cats. Nikki and I looked around and wondered “Could it be, could people actually live here?” Nobody would be able to fit in one of those little shelters, but maybe that’s only where they rest their heads. We left the area pretty quickly at that point. The man that called to us explained that there is one group living in the woods behind the McDonalds at Pantops; there is another group living where we were standing. We wished the man a good evening, and started on our walk home. Nikki and I wondered what we could do to help those people (and cats). To compare Flickr video versus YouTube, I uploaded the same video from last week to Flickr. During the process I learned that Flickr only allows clips to be 90 seconds long, and 150 MB in length. This made the upload process an ordeal, because I had to edit out 10 seconds of footage, and then convert the resulting ~300 MB avi file to a more compressed format (I used Super to convert the file to a 14 MB H.264 mov file). The YouTube uploader was smart enough to encode the video as it was being uploaded. On my system, the Flickr video had better color and detail, but playback was choppy. Here are the results, so that you may judge on your own machine. This evening, Nikki and I stumbled upon these guys taking off very close to our house. A beautiful end to a beautiful day.